At the end of each year, my email inbox and mailbox fill up with requests from nonprofits. I realize, Hungry For A Day is just one of many requests you’ll receive this season. 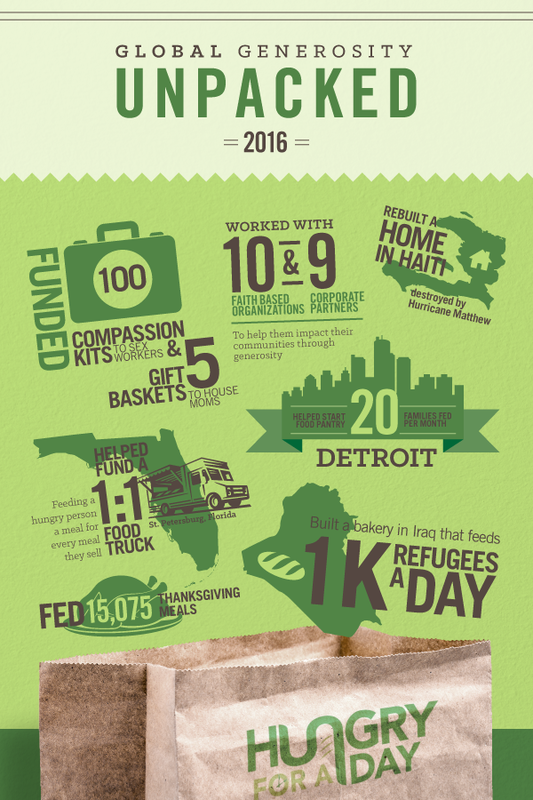 Give me 90 seconds to share why you should support Hungry For A Day this year. Simply put, we could not have done any of this without you. Thank you so much! When you gave to a project this year, 100% of your donation went DIRECTLY to the cause you believed in. To make this possible, last December our amazing community funded all our operating costs for the year. This year, we need to raise $19,500 to cover our 2017 operating costs. Our donations increased 330% in 2016! We strive to keep operating costs as low as possible, however, it costs more to give more. So, our costs have increased 55% in order to support the growth we have achieved. We need $53 a day to cover expenses such as postage, administrative costs, credit card processing & IRS fees, etc. Some of you can fund a day ($53) or a week ($371), others can sponsor a month ($1,643) or more. Still, others can give a recurring donation each month in 2017. Whatever you give will be appreciated. Thank you for helping us to impact so many! To give, simply click h4ad.com/give or mail a check (P.O. Box 669486, Marietta, GA 30066). We look forward to partnering together in 2017 to grow and enrich even more lives!